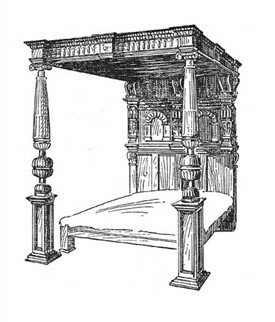 Late 16th centurary bed - the posts are nulled and the lower turned portion is of the cup and cover type. Where did the original four-poster bed for ‘The Quiet Man’ come from? This story, though known locally by some people, has never been recorded or written down to date. During the planning and making of the film John Ford’s team were looking for props. They visited Cloonacastle House, Ballinrobe and spoke to Mrs Patrick Walsh (Catherine Walsh née Mellett) and asked her if she would consider loaning the bed for this historic film. She consulted her husband who she was nursing at that time. She also spoke with her sister, Halóg Lloyd. 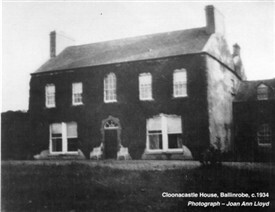 The bed and a lot of magnificent quality furniture would have been in Cloonacastle House when it was bought by Patrick Walsh, lock, stock and barrel, circa 1929. The four-poster was solid, in very good condition, though antique. It could have been there for centuries. It was always in the front guest bedroom on the left hand side of the house, as you look out onto the front lawn and avenue. This room was joined to another room behind it. Both rooms had doors into them from the spacious landing on the first floor over the entrance downstairs. There was an interconnecting door in the middle of the wall between those two rooms. The four-poster bed was located on the right hand side of the front room between the door in the wall between the two rooms and the right hand wall of the front bedroom, which gives an idea of its size. The wall and middle door between those two rooms were removed in recent years and the door of the back room to the landing was closed. These two rooms are now the boardroom of the Ballinrobe Golf Club. The view from the front windows is of the 18th green and of the front avenue which is located between the 12th and 18th holes. When the film was finished John Ford’s team returned to Cloonacastle House and spoke to Mrs Patrick Walsh. They said that those involved in the film wanted to present the four-poster bed to John Ford, the director, as a gift, if she would agree to this. After consideration and because of the quality of this Mayo film and of the director and cast, she agreed. After the four-poster was presented to John Ford it’s presumed that it was sent to America and formed part of his home and estate. Where in the world is the bed it now? It would be fascinating to know what exactly happened to it and to find out its present location. The exact prototype and date of the making of the antique bed could then be precisely established. This story is as accurate as possible as it was told to us many times by those involved. Catherine (Kit) Walsh was our aunt. 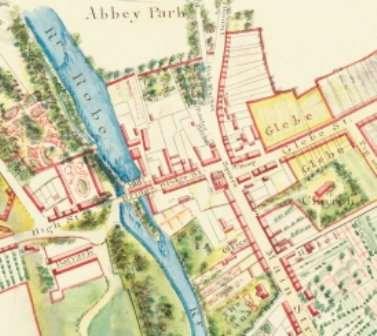 She was the second eldest daughter of our grandparents, Mark and Winifred Mellett, Cloonenagh, Ballinrobe and Crossboyne. Our mother, Halóg Lloyd (née Mellett) who was twenty years younger than Catherine was the youngest was the youngest and last survivor of the family of 11. She died on January 10, 2007, in her 100th year. It seems fitting that the original true story of the four-poster bed should be told via The Mayo News to celebrate the 60th Anniversary of ‘The Quiet Man’ and to pay tribute to all those who played even a small part in the making of that excellent Mayo film, directed by John Ford. 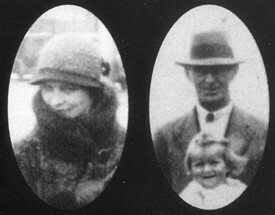 Joan Ann Lloyd is a niece of Catherine Walsh (née Mellett). Catherine Walsh loaned the four poster bed for use in The Quiet Man. It was presented as a gift to director John Ford afterwards. This page was added by Averil Staunton on 02/03/2012.